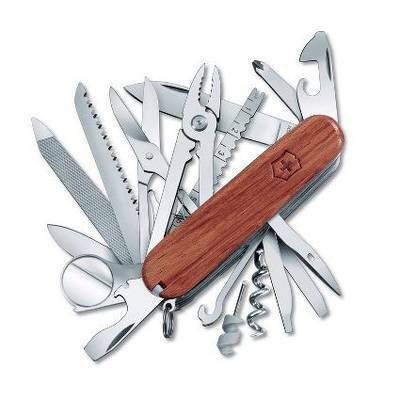 Swiss Champ Multi Tool, "Swiss Champ"
The SwissChamp by Victorinox is one of the most robust multitools in the Swiss Army knife collection, and our version trades the classic red plastic exterior for a handsome walnut hardwood case. With more than two dozen tools in one compact design, it's the ultimate utility for city or trail. Features a large blade, small blade, Phillips screwdriver, can opener with small screwdriver, corkscrew, bottle opener with large screwdriver and wire stripper, hook, scissors, wood chisel, pliers with wire cutter, fine screwdriver, wood saw, mini screwdriver, fish scaler with hook disgorger and ruler, metal saw with metal file and nail file, straight pin, magnifying glass, toothpick, tweezers, key ring, and reamer with sewing eye.